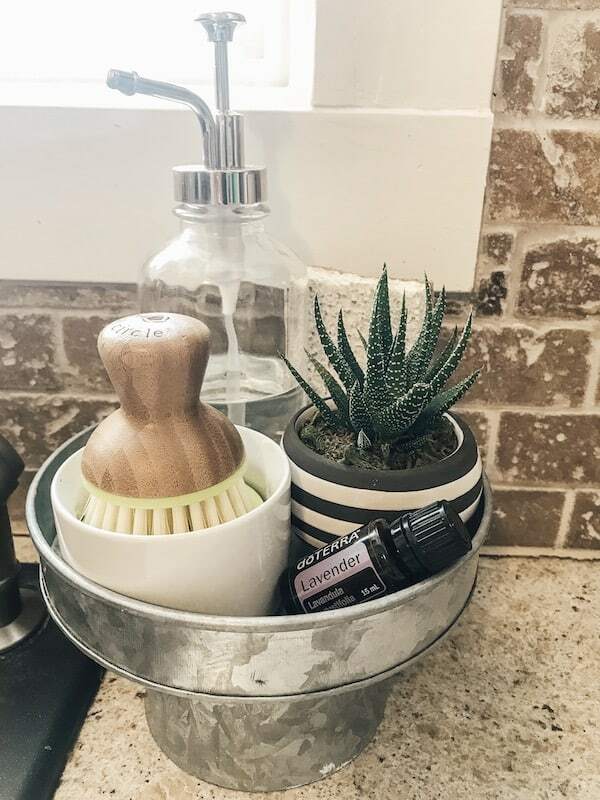 Spring cleaning with essential oils goes so well together. Almost like peanut butter & jelly, right? After a long winter, I’m anxious for spring and all things fresh & clean. And I’m about doing things as natural as possible. 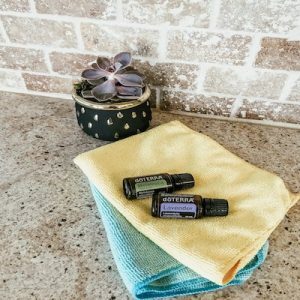 So, why clean with essential oils? 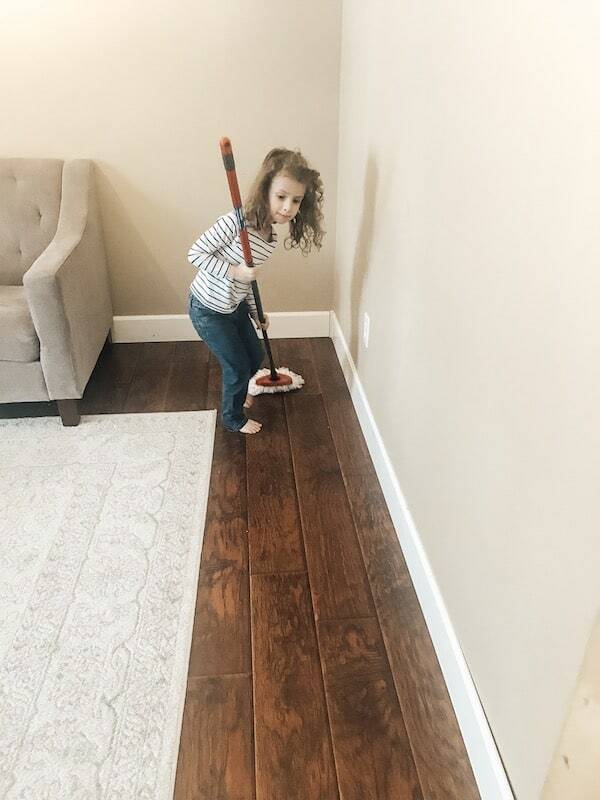 Because we are working on natural living, we ditched the toxic cleaners a long time ago. And essential oils are a perfect replacement for those standard cleaners. What better way to bring in some of those springtime scents than with essential oils. Plus some essential oils actually have some amazing cleaning capabilities. So they make a perfect addition to any cleaning routine. Essential oils are also 50-70 times more powerful than just using herbs alone for natural cleaning. They contain properties that makes them really helpful at fighting seasonal & environmental threats. 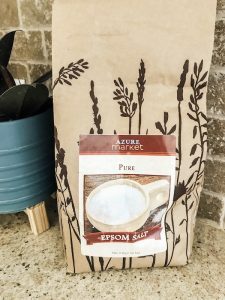 Research has shown that eucalyptus, lemongrass, orange oils, tea tree, thyme, and peppermint were effective at fighting seasonal and environmental issues. 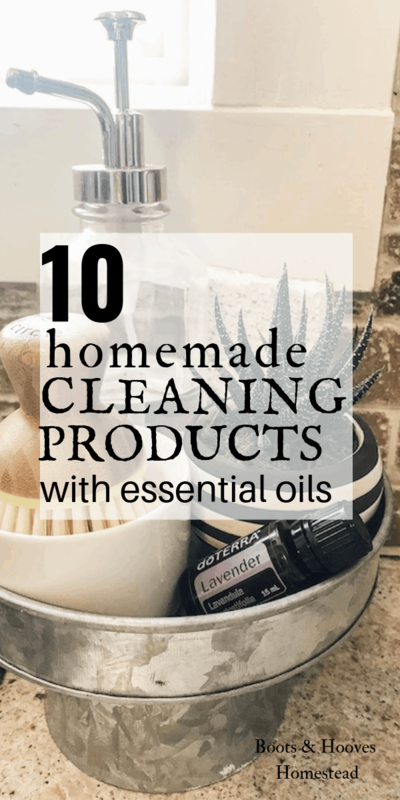 Eucalyptus, peppermint, and citrus oils are usually my top choices for cleaning. Citrus oils are also great for cleaning up grease and grime. doTERRA also sells On Guard essential oil which is a great disinfectant. 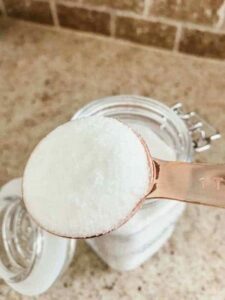 I’m adding a summary of the supplies you’ll need before getting started with creating these cleaning products. Amber or Dark Blue Glass Spray Bottles. It is best to store essential oils in dark glass containers. Oils can actually break down plastic and the dark colored glass protects the oils for deterioration. Label maker This is the label maker that I use for all things around the home. It is pretty helpful in keeping track of all my oily creations. Liquid Castile Soap I use this for a variety of things around the home like cleaning and making foaming hand soaps. Baking Soda Here is a nice clean version and makes a great scrub. Vodka or Rubbing Alcohol I don’t usually like the scent so I alternate between using alcohol and witch hazel. Microfiber Towels. I use these for everything and this brand is awesome! And it’s a really good deal. Find more natural cleaning products and items for the home here! 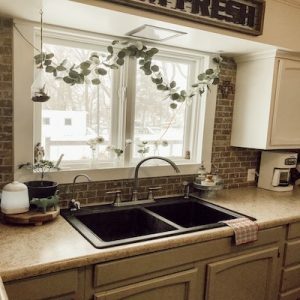 Here are 10 of my favorite cleaning recipes to use around our home. They’re all natural and smell super fresh with added essential oils. And don’t be afraid to try out a variety of different oils to suit your preferences. I like to mostly use eucalyptus and citrus oils for cleaning because they smell super fresh. These fresh scents make a great choice for spring cleaning with essential oils! If you don’t have any of the oils that I recommend, feel free to substitute with your favorites! Ingredients: vinegar, water, lemon & melaleuca (tea tree) essential oils. Using a glass spray bottle (I use a 16 oz), mix half with vinegar and the other half with water. Add in 10 drops each of lemon & melaleuca essential oils. Shake well & shake before each use. Ingredients: 3/4 cups vinegar, 3/4 cup water, 1/4 vodka (or rubbing alcohol or witch hazel), 15 drops of melaleuca essential oil, 15 drops of doTERRA’s On Guard blend. Add all ingredients to a glass spray bottle & shake well. Shake before each use. 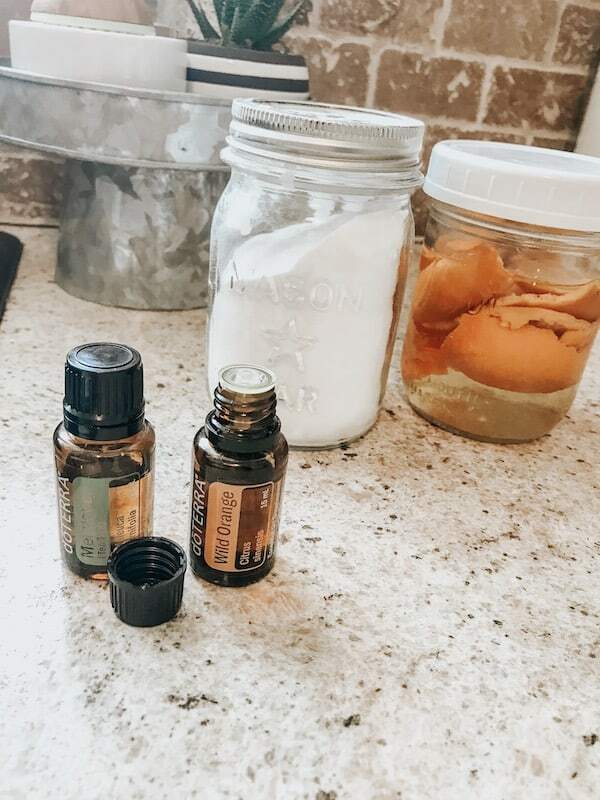 Ingredients: 1/4 cup vinegar, 1 gallon of hot water, 2 tablespoons of Castile soap, approximately 15-20 drops of eucalyptus and peppermint essential oils. (use less if the scent is too strong for you). Or you can try a more mild and children friendly scent of 10-20 drops of a citrus oil or blend. Combine everything in a large bucket and clean your floor as usual. 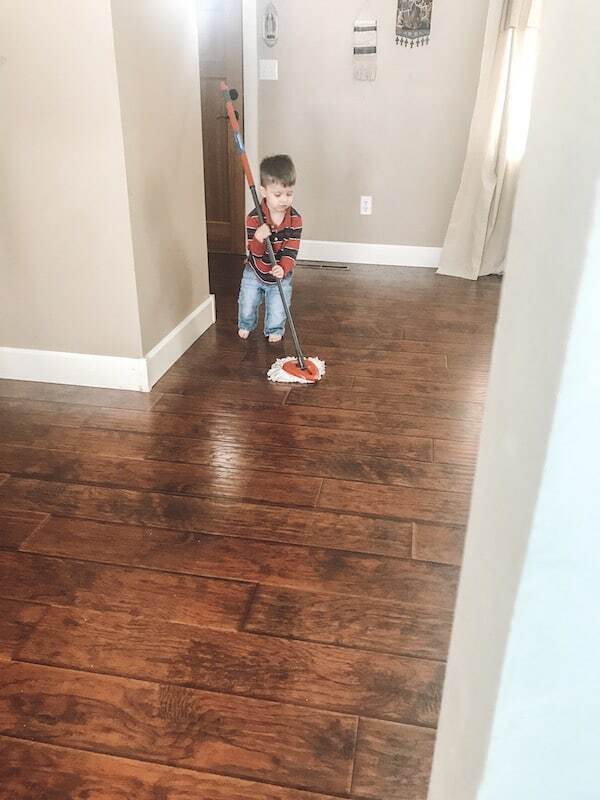 I have some pretty cute helpers! Ingredients: 1/4 cup olive oil, 1/4 vinegar, 10 drops of lemon essential oil. Add to glass bottle and give it a thorough shake. The vinegar and oil will separate so be sure to mix well before each use. Ingredients: 1 cup of water, 1/2 cup vinegar, 10 drops of wild orange or lemon essential oils. Mix everything in a glass spray bottle and use as usual to clean glass & windows. Ingredients: 1/2 cup vodka (or rubbing alcohol, but vodka seems to work best), 1 cup water, 10 drops of peppermint essential oil, 5 drops of lime essential oil. In a glass spray bottle, add all ingredients and mix well. Spray down the shower and tub daily after each use. You don’t need to rinse after spraying. Ingredients: 1 cup of baking soda, 20 drops of essential oils of choice. I alternate scents depending on my mood. This time I used half and half of melaleuca and wild orange essential oils. Mix up oils and baking soda in a glass jar. I poked holes in the top of my lid and use the jar to shake over the carpet. Allow to sit for approximately 15-20 minutes and then vacuum as usual. Baking soda is a great and inexpensive way to absorb and neutralize carpet odors. Plus the added essential oils makes for a great refreshing scent. Ingredients: orange peels, vinegar, 10 drops of essential oils of choice. Save those leftover orange peels to make this awesome cleaning spray and disposal refresher. It really serves as a multi purpose cleaner. Using a glass mason jar, fill with orange peels and then top off with vinegar. I don’t really measure this but just fill up as needed. You really just need to make sure the oranges are covered. Use a few of the softened orange peels to run through the garbage disposal to give it a refresh. Then you can add about 5-10 drops of your favorite essential oils to the orange vinegar solution. Or use it without the extra oils. Strain and add to a glass jar. Use it as a multi purpose spray and clean as usual. Ingredients: 3/4 cup baking soda, 1/4 cup Castile soap, 1 tablespoon water, 10 drops of lemon or orange essential oils. In a mason jar, add all ingredients and mix well. Use to clean difficult areas that need extra scrubbing power like toilets and sinks. Ingredients: 4 oz glass spray bottle, 30 drops essential oils, 1 table spoon witch hazel, top off the rest of the bottle with distilled water. 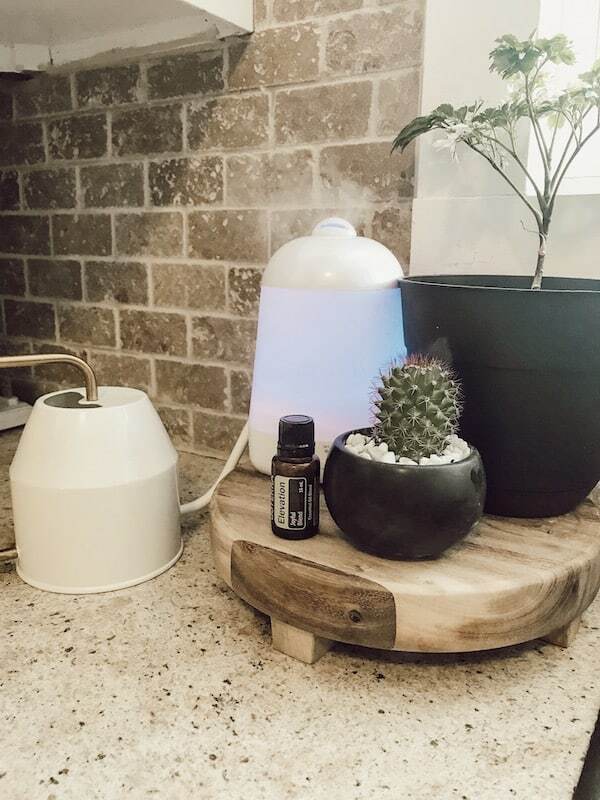 These scent combinations also makes great diffusing blends!